With less than two weeks until Christmas, I’m guessing that many of you are approaching your shopping finish line. I personally always struggle with the guys. Husbands, fathers, brothers….they tend to be the most difficult for me. 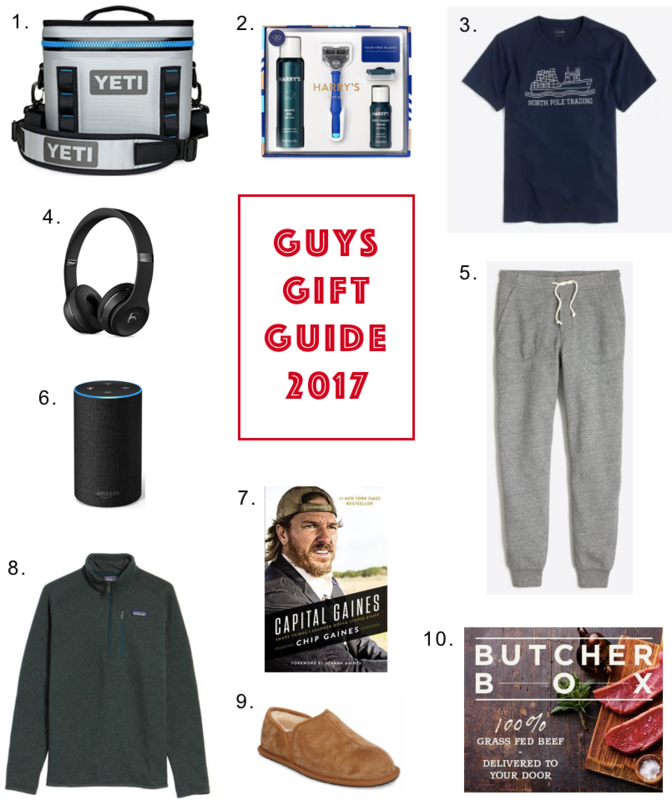 I’ve spent some time curating a guys gift guide that I’m hopeful will help you check off any remaining guys on your list….it did for me! 1. Yeti Cooler: Both Jack and I are big fans of our Yeti tumblers. They keep our drinks hot or cold for hours on end. According to the reviews on their coolers, it seems that they just might be worth the price tag. 2. Harry’s Shave Set: Harry’s has quickly become Jack’s favorite shaving set and now that it’s available at Target, I’m happy to pick up the refills! 3. North Pole T-shirt: I love a good festive t-shirt, but they aren’t as easy to find for the guys. This one would be right up Jack’s alley. Festive without the tacky. 4. Beats Headphones: My husband loves these headphones. The battery life is fantastic, the sound is powerful and the cordless feature allows him to workout with them or even go running. 6. Amazon Echo: If you’re looking for a gift for him that you could actually benefit from? It’s probably the Echo. We’ve had ours for a number of months now and Alexa is kind of my new best friend. I basically use it to have music playing lightly all day long, and it’s been the best thing ever….especially during Christmastime! 7. Capital Gaines: My husband may not be quite as big of a fan of Fixer Upper as I am, but he is certainly a huge fan of Chip Gaines. This was one of the very few items on his Christmas list. 8. Patagonia Pullover: These fleece pullovers are great because they can serve as both a jacket or an extra layer under a coat. They also come in a great array of colors. 9. Ugg slippers: My husband wears these around the house on a daily basis. For the amount of wear they get it’s worth the investment in a pair that will hold up for him and these have passed the test! 10. Butcher Box: Another one of those gifts that you could benefit from too ;) Butcher Box is the leading online source for grass-fed beef (they have chicken and pork too!). Each box contains a months worth of meat, delivered right to your door. I love any excuse to avoid the grocery store!